Good risk management under a contract requires contractors and subcontractors to be thinking about the contract throughout the life of a project. Landscape Ontario's Standard Form Snow and Ice Maintenance Contract standard form contract was prepared through the Snow Committee of LO’s Maintenance Commodity Group, which included representatives of insurers and the legal profession. The Committee’s goal was to develop a Contract that was fair to both the contractor and the property owner/manager. The Committee was given this mandate because LO members and their insurers faced an increasing number of slip and fall claims over the last several years, leading to increased premiums for many snow maintenance contractors. This increase in the number of claims can have a number of potential causes. One of these is a poor contract. Sometimes the contractor inadvertently agrees to perform more work than he or she intended. In other circumstances, the contract is so vague or ambiguous that it is impossible to tell if the contractor met his obligations. In still other circumstances, the contractor agrees to indemnify the owner for damages he did not cause or contribute to in the performance of his work. property owners and managers may request changes. Accordingly, contractors must take care in using the standard form, understanding its structure and the meaning of its terms and conditions. Contractors must also understand how the various ways the contract can be filled out will determine the allocation of risk between the parties. The standard form contract is in two parts. The first part contains terms and conditions that can apply to all premises. 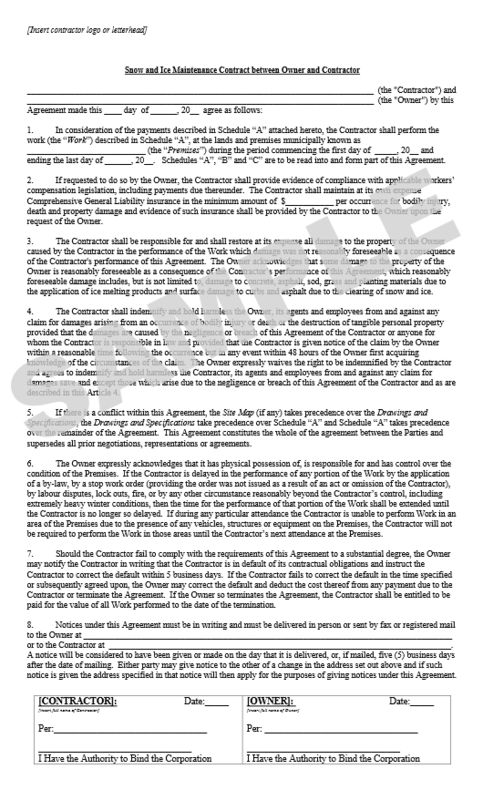 Among other things, this part details the duration of the contract and who the parties are. It deals with issues such as Worker’s Compensation legislation, insurance, notice provisions and the potential for the contractor to be impeded or delayed in his work. The first part also addresses the extent to which the contractor will indemnify and hold harmless the owner in relation to a slip and fall. The contract is drafted so the indemnity generally applies only if the contractor is negligent or fails to perform his work in accordance with the contract. All contractors should be wary of extending an indemnity any further in this regard. Contractors should also recognize that as the indemnity focuses on the contractor’s work, it is extremely important that the work be clearly and accurately described in the contact. The second part of the standard form contract is the “Schedule A.” This specifies the work to be performed by the contractor and includes the provisions by which the contractor is to be paid. The Schedule A details the “fixed price” portion of the contract, how and when ice-melting products are to be applied at the premises and how extra work is to be requested by the owner. This part of the contract will vary from project to project. The contract provides that drawings and specifications will be attached to the Schedule A to detail the scope of work. It is anticipated that the contractor will prepare a site map of the premises upon which he can describe, in detail, the work he is to perform. (It is almost impossible to accurately describe the work without a site map). Further written specifications should also be attached if the written specifications cannot be fully incorporated into the drawings. To assist the contractor in preparing the drawings and specifications (and towards ensuring consistent and clear terminology), Schedule A includes definitions for the tasks generally performed by snow maintenance contractors. For the contract to be consistent and clear, the contract anticipates the contractor will use the defined terms to describe the work in the drawings and specifications. One very important part of the standard form (and of any snow maintenance contract) is that it determines when and how ice melting products are to be applied to the premises. This is significant because in the vast majority of slip and fall cases, the question of who was responsible to determine when, if at all, ice-melting products were to be applied is raised. This responsibility lies with the owner unless and until it is transferred to the contractor. Accordingly, the contract should properly and accurately detail the extent to which the contractor assumes this responsibility. The standard form addresses this issue by allowing the owner to give the contractor full discretion to monitor the weather in the vicinity of the premises and, applying the standards of custom of the trade, apply ice-melting products as appropriate. If the contractor assumes this responsibility, he can be liable if he breaches this standard. If the owner gives this discretion to the contractor, he is obliged to pay for whatever ice-melting products the contractor decides is appropriate. On the other hand, if the owner declines to give the contractor unlimited discretion, the responsibility to determine if and when ice-melting product is to be applied stays with the owner. In that circumstance, the contractor is responsible only to apply the ice melting product as specifically directed by the owner. In summary, if properly used, the standard form will allow the contractor to limit his liability to, and accurately describe, the work he agrees to perform. There is not enough space in this article, however, to fully discuss how the contract can be used to accomplish this goal. The contract is only one part of a sound risk management strategy.